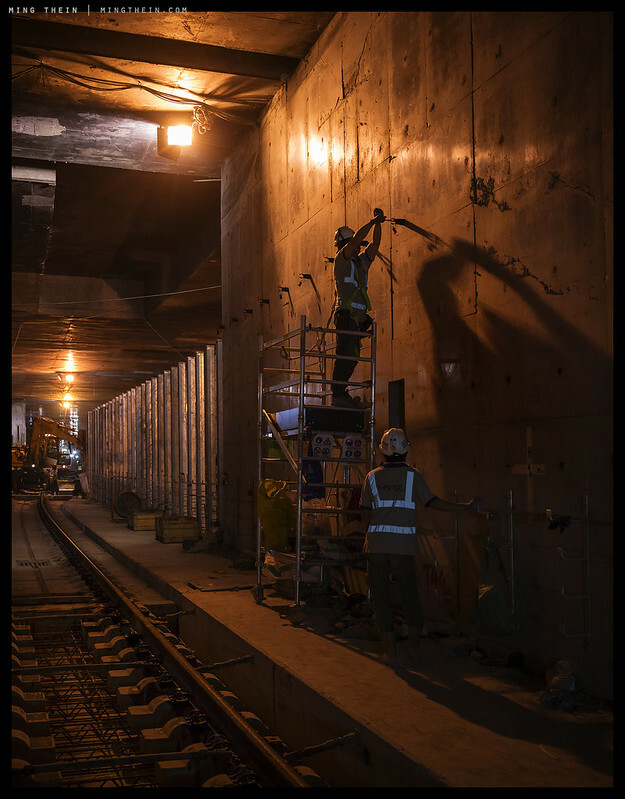 In this series, we see the work somewhere in the final third: the tunnels are complete, the walls are lined and most of the large-scale construction is complete. Supporting slabs underpinning the tracks are in the process of being laid. The tracks themselves have not yet been completed, and full electrical cabling and passenger-facing facilities and amenities are not yet installed. It’s actually a good time to do project coverage from a client standpoint as there has been enough work done to give a sense of the scope of the project, with long ‘gallery’ views and men visibly working to give a sense of scale – but not so much that it looks complete. I had also visited the various sites of the project much earlier on – but there was really not a lot to see on a larger scale as when tunnelling is in progress, the machine occupies most of the tunnel and it’s impossible to photographically capture a sense of scale since most of the cavity itself is filled in, and of course there are no men near the working face for safety reasons. I also find that images tend to be a bit disorientating because the walls and floor of the excavation can often be covered in irregular mud, rock, or soil – all of which are fractal-type objects and do not really offer cues to physical size. On top of that, lighting is either harsh and very directional/dark, or uniform – depending on the kind of work taking place and the requirements of the workers – which further makes it difficult to fully appreciate other than at very large scale output. *Historical tidbit: the Hoover Dam had so much concrete in it, hollow steel pipes were used both as reinforcement but also to carry cooling water to accelerate setting. 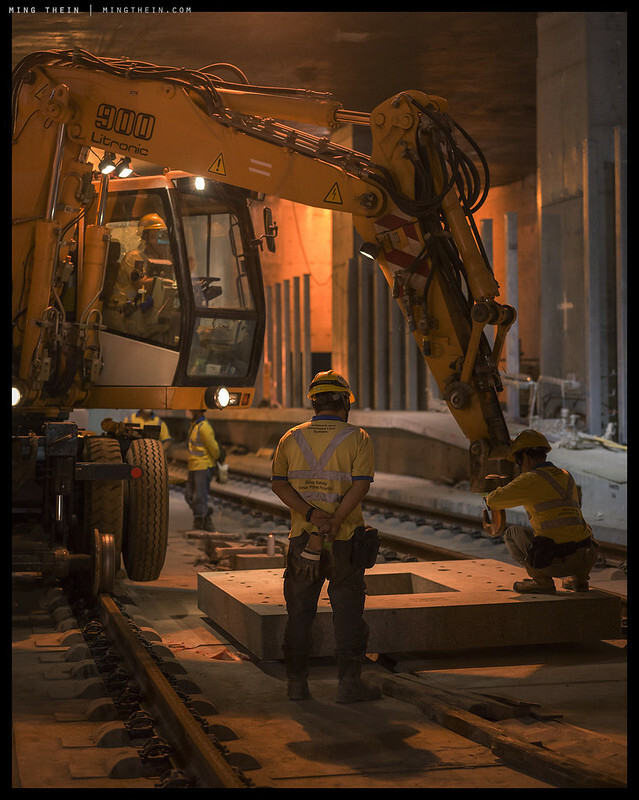 On top of that, given the documentary nature of some of the work – you want to both capture authenticity and not interrupt the process (some processes, like tunnel boring, can’t be interrupted) – which means you need to be able to react quickly. Even though there are times when you’re working in a slower, more ‘architectural’ style, off a tripod and with camera movements – sometimes interesting things take place nearby and you’ve got to be able to switch between one way of working and the other on very short notice. I find that having an assistant for this kind of thing doesn’t really help because I want all the gear on me for as fast access as possible. This can often amount to as much as 20kg if I’m working with a full setup (two H bodies, five lenses, HTS, spares, sufficiently heavy tripod, Cube, water safety harness and helmet, etc.). There’s also the general lack of light to contend with, and huge variance in color temperature of ambient sources – light is light and whatever is handy is used by the workers; that could be older sodium vapour stuff, fluorescent installations that are to be a permanent part of the construction, or modern portable battery-powered LEDs. You’re constantly having to do a lot of post-compensation for strange mixes of color temperature to be perceptually acceptable (even if what was captured was accurate), which means that the more dynamic range and color latitude possible, the better. For the documentary situations, a tripod isn’t so useful anyway because you need a sufficiently high shutter speed to freeze action – that means working at ISO 3200 or ISO 6400 a lot of the time. Whilst smaller sensors can still give you clean results, what you start losing very quickly is dynamic range and color differentiation – I think this actually remains the biggest advantage of larger sensors. Here are two examples of what I’d consider to be exemplary performance under really difficult conditions. Both are presented here as 100% crops, with no noise reduction. 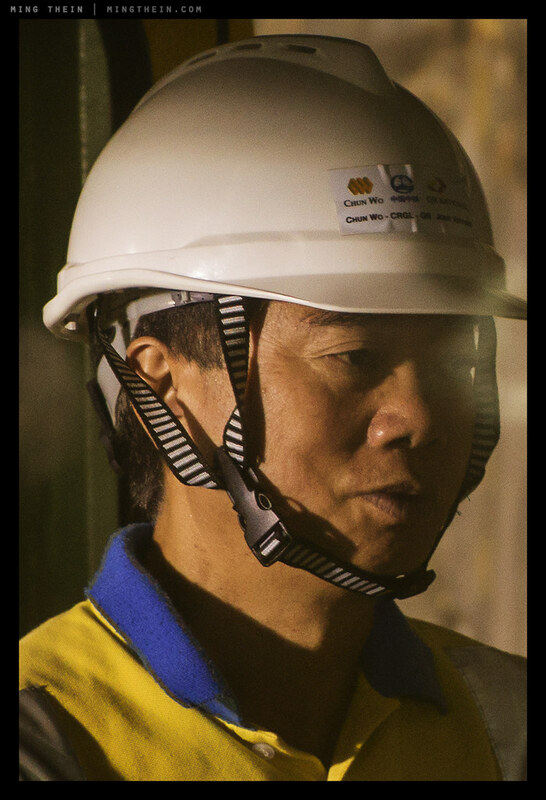 The crop of the train man portrait was shot at ISO 1600, under strong fluorescent light; note that most of the information sits in the yellow channel, and he’s behind a layer of glass. 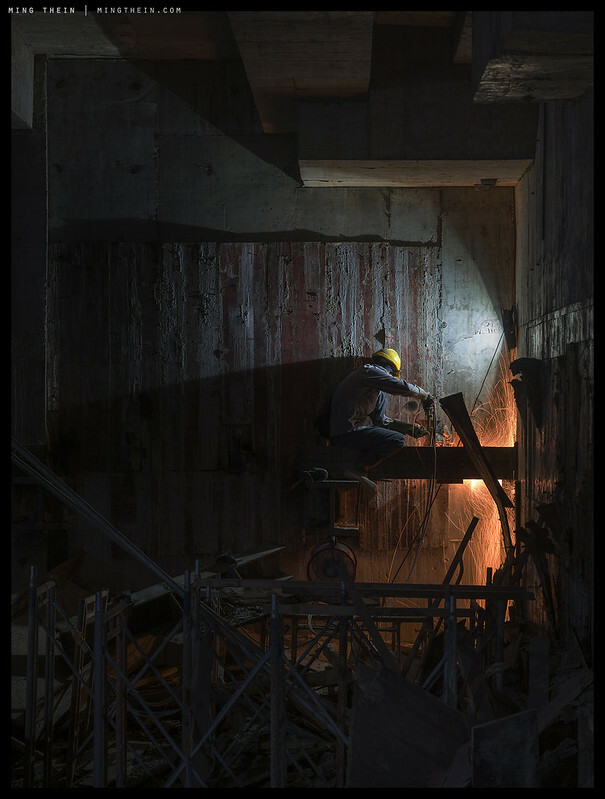 For the other worker, I had to push the shadows 1.5 stops because he was backlit by a sodium vapour light (color corrected in post). This was on top of being shot at ISO 6400 – for an effective ~ISO19K rating. Note again surprising accuracy of skin tone and fine detail preservation. At the time of shooting, I was also debugging a very late version of the X1D firmware; for this shoot, it replaced the one of the H cameras as primary body, and I went a little lighter on the load out – H5D-50c body, tripod, 24mm, 35-90mm, 150mm and 90mm on the X. I found that the H-X pair allowed me to have the H5D set up for tripod work, and the X1D always ready to go for documentary grabs; whilst I could do the same with two H bodies, having one extra one swinging around your neck at all times isn’t really practical (and tends to bash into whatever is in front of you). The X1D stayed out of the way, and provided a lot of the the opportunistic closeups you see here. I could have done the same with two X1Ds and one set up for tripod work with H lenses and the H-X adaptor, but a second camera wasn’t available at the time – not to mention balance with the larger lenses like the 35-90 and tripod mount on the body being a bit too front-heavy. In future, it’d definitely be much easier physically to go with a pair of X-bodies. 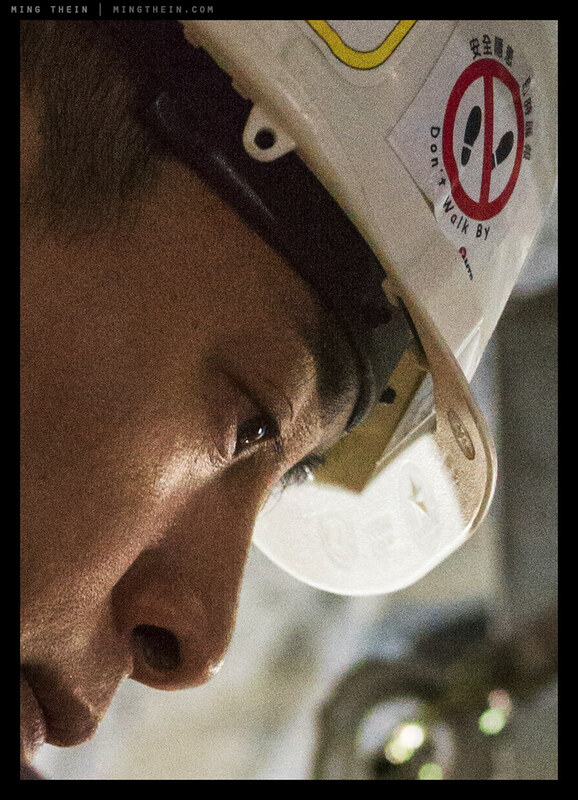 Images used with kind permission of Chun Wo Construction Holdings Limited, Hong Kong. Shot with a Hasselblad H5D-50c, X1D-50c, H24, H35-90, H150II and X90mm lenses, and post processed with Photoshop Workflow III. Would the H6D-100c have given your some additional advantages, such as the ability to use primes (HC50II and H100) rather than the 24-70, i.e., faster and more real estate to crop, and more up-to-date sensor? I ask because i’m about to jump from the same camera you used here to the H6D-100c. A bit more dynamic range, and more coverage with the 24mm/HTS – the latter is significant, because we go from a 28mm-e to a 22mm-e. It may have taken effort to tame the color variances, but consider yourself blessed to have found those sodium vapor / fluourescent contrasts in place. It looks as if a massive movie set lighting rig was deployed a great expense and effort. The same applies to the welding vs. ambient light contrast. Beautiful stuff. I sure hope the client is happy. These are great images. 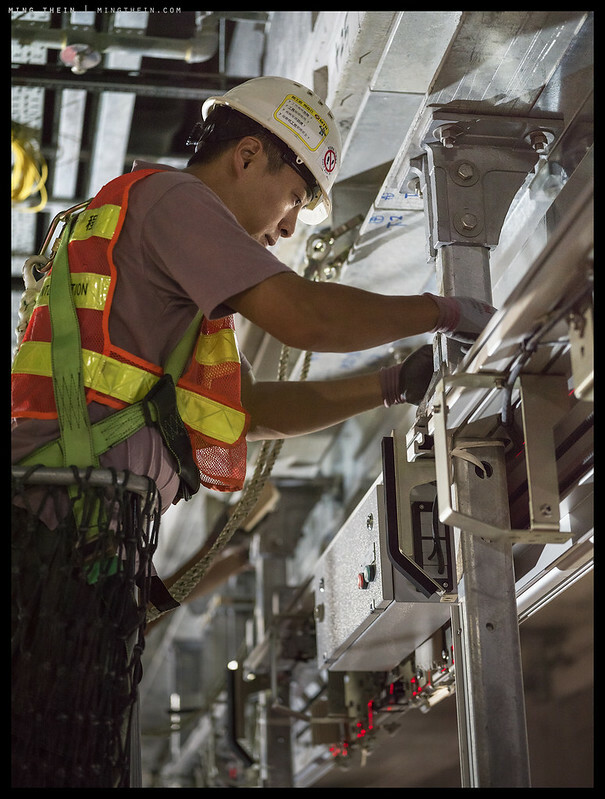 “Industrial” photography seems so few and far between these days, and images like these remind me of all of the great corporate annual report work that was so common years ago. This is a really professional work, very nice executed. Must have taken a long time for post-production. I wonder how you archived the stars in the first picture. 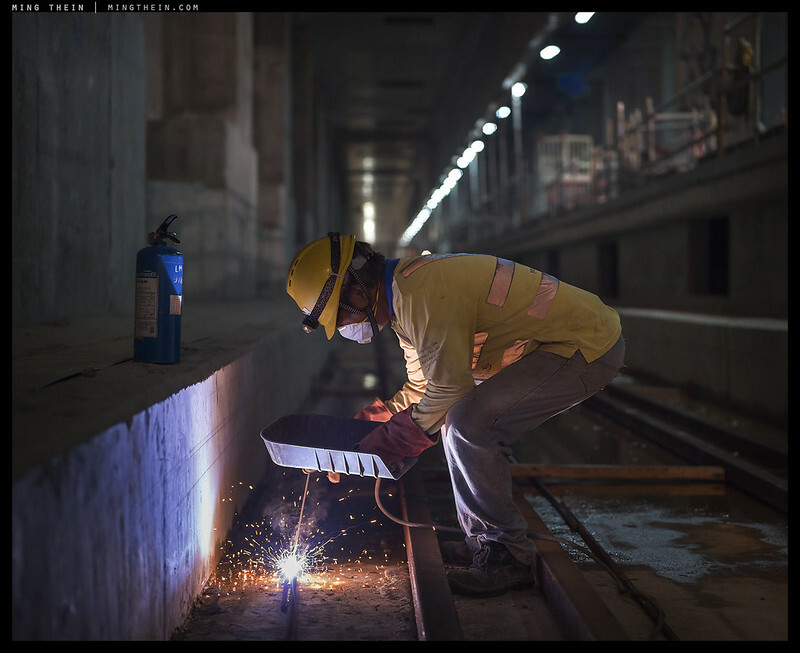 Using a very small aperture (yes, it´s sharp from foreground to background) usually means a long exposure (the worker on the left side is not very much blurred) or a high iso. Impressive, the picture works very well as do all the others. Thanks – post production was actually very fast on a per image basis, because the Hasselblad gets the colours right 🙂 However – it wasn’t fast in totality because there were a lot of images! Stars: stopped down to about f11 or so, lens design with a multi bladed aperture. Fantastic work, Ming. Nicely done. It must be a great feature of your job to get into places the public can’t. The 100% crops, to me, look very much like film. As usual, interesting and beautiful photos. Wow! 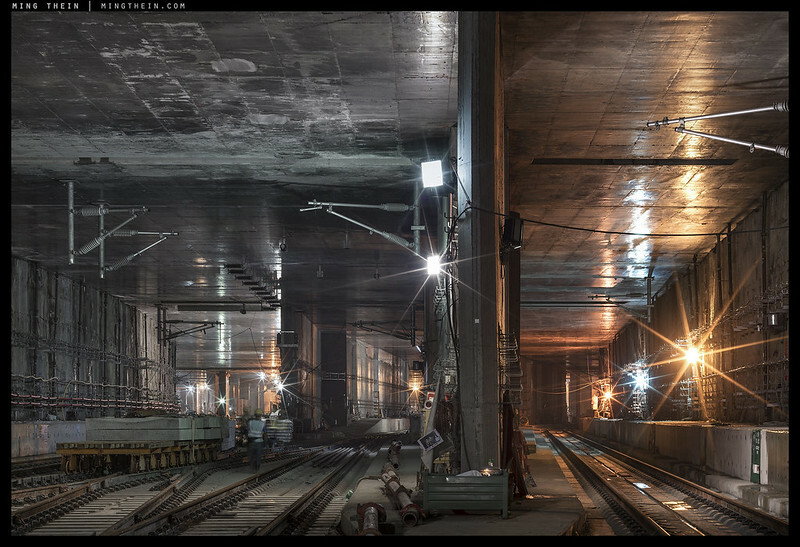 I would never have thought that someone could make beautiful photographs of such a “mundane” project. Your photographs somehow convey both a documentary sense of the project while at the same time qualifying as art. A good article to remind me not only of the value of having the right tools for the job, but also the skill and vision that they serve. Yeah, mundane wasn’t the right word. Unglamorous, maybe? But that could be part of the difference. I was thinking of the project from that angle, whereas you saw (and expressed in your photographs) the scale and grandeur of the project. The one of the man welding (846) is epic. 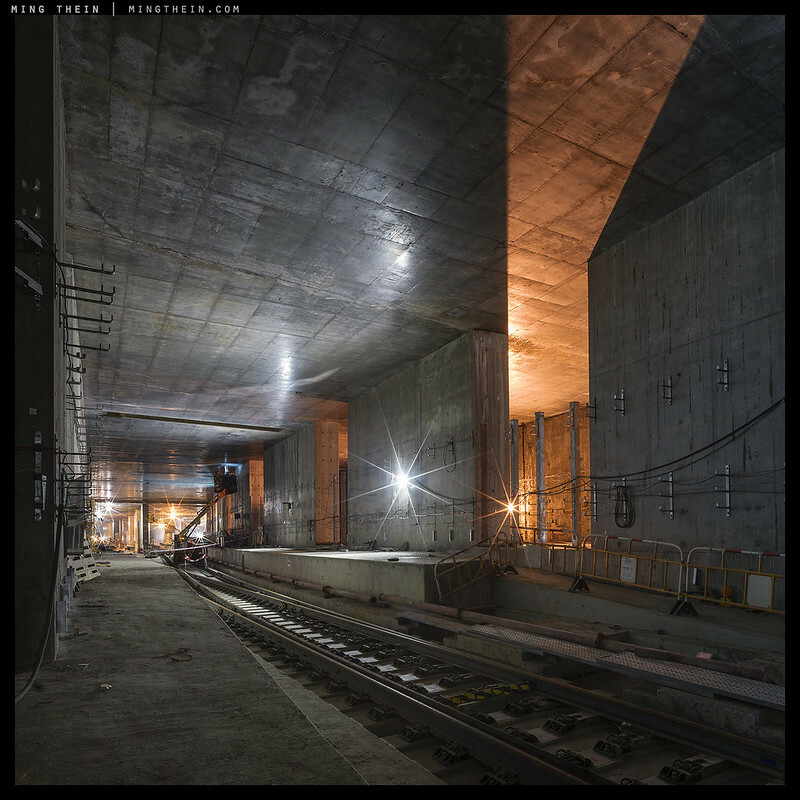 And the first two really convey sense of awe at the enormity of the project. yes. Not many people appreciate the hard work these workers put in. Some get killed every year, approximately 20+ in Hong Kong, and very unfortunate. I never thought I’d say this but… I’d love to see a “selfie”. Hi Ming. Stunning work as usual. For the X1D at higher ISOs, I have found that Phocus produces files with much lower noise. 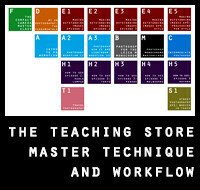 I hate that this is so, because my work flow centers on Adobe ACR/Lightroom. But Adobe’s processing engine is currently not very good for the X1D—abysmal for higher ISO work. Phocus produces very clean files for higher-ISO images from the X1D. Iridient is also much better than Adobe—at least as it stands with the current processing engine in ACR/LR. In print, these will have me flying to see the next Ming Thein gallery exhibit. Magnificent work. A human feel to an extra-terrestrial environment to us surface folk. Great set! Stunning images under very difficult circumstances. Well done!